I make stir-fry for dinner fairly often. Usually it's a version of Kung Pao Chicken served with brown rice, but since I'd made risotto the previous night, I thought I'd try serving it with noodles. 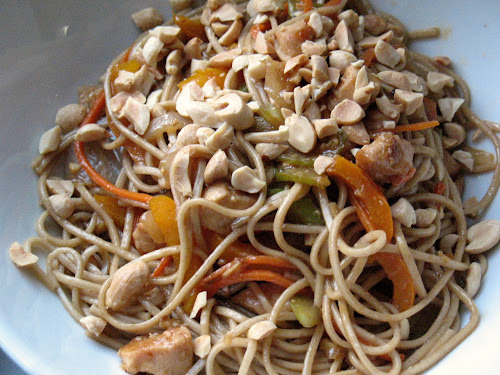 I knew what I wanted to do with the dish, which was sauté a bunch of vegetables and chicken with a savory garlic-ginger sauce and serve it with noodles, in this case soba noodles, since that's what the grocery store had. What I didn't know was what the most accurate name for the dish would be. I learned that the key difference between chow mein and lo mein is that in chow mein the noodles are fried and in lo mein they aren't, so I went with the latter. I couldn't call it yakisoba, since the noodles in that dish are fried (according to Wikipedia, it is thus a variant of chow mein). 1. Bring a large pot of water to boil. Add noodles and cook according to package directions (the noodles I made cooked in 4 minutes). Drain noodles and set aside while completing other steps. 2. Add chicken to large bowl. Combine other Step 2 ingredients in a small bowl, pour over chicken, stir to coat and set aside during Step 3. 3. Heat canola oil in a large, steep-sided skillet over medium-high heat. Add onion and celery and stir-fry until tender, about 5 minutes. 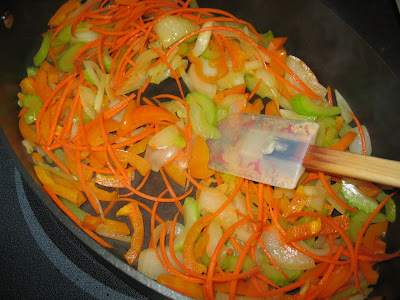 Add bell pepper and carrot and stir fry another 5 minutes. Remove vegetables from pan and set aside. 4. Heat canola in skillet. Add ginger and garlic and stir-fry about a minute. Add chicken with marinade and sauté until the chicken is cooked through. Remove from pan. 5. Combine all Step 5 ingredients in a small bowl. Add to pan and cook a couple minutes to thicken. Reduce heat to medium. Return cooked vegetables and meat to pan, stirring to combine with sauce. Serve topped with chopped peanuts and scallions and, for kick, a squirt of sriracha. Whether you call it lo mein or chow mein, it's delicious! You can never go wrong with noodles as far as I'm concerned.